You might expect that primates, particularly chimpanzees and gorillas, have hands similar to humans -- fingerprints and all. But one other animal from an entirely different infraclass of mammals has fingerprints almost indistinguishable from humans. The tree-hugging cutie of Australia, the koala bear, has fingerprints that are similar to humans in pattern, shape and size of the ridges. The parallel ridges on your fingers likely developed to help with grip. Koalas display fine motor skills and require their hands to sustain static pressure, much like humans, when they climb vertically, hold onto small branches of the eucalyptus tree and reach out to grasp leaves for dinner. Fingerprints are present on both sexes and in all ages of koalas. Even when viewed under a microscope, koala fingerprints are almost identical to human fingerprints. 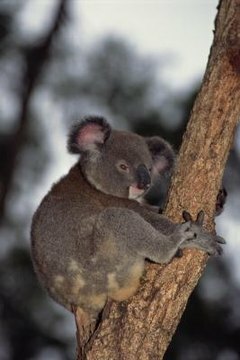 Close relatives of the koala, such as wombats and kangaroos, do not have fingerprints. The vulpine phalanger, a type of possum called a cuscus, also has fingerprints, but not as defined and similar to humans as koalas. Koala fingerprints cover a smaller surface area than human prints. A person's entire palm and fingers are covered with distinct ridges, while only the fingertips and a portion of the koala’s palms and feet have the prints. The parts of their hands and feet that are not covered with prints have a wart-like projection. Even if other species do not have fingerprints, they do have identifying features. Some animals, such as other species of phalanger, have fingerprint-like ridges on their tails. Animals with hairless snouts, such as pigs and dogs, have unique nose prints. Tigers' stripe patterns are unique to each animal and can also be used to identify a particular animal, just like a fingerprint.